From 1979 to 1989, the Soviet Turkestan Military District's Air Force units continuously conducted missions over Afghanistan. 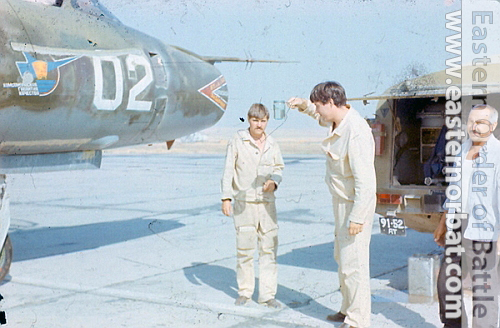 As the units settled at airports near the Afghan border they were frequently deployed throughout the war. 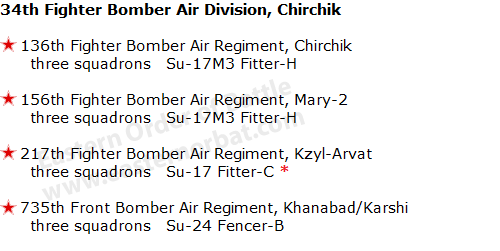 The three fighter-bomber regiments and a front bomber regiment became the subordinate to the 34th Fighter Bomber Air Division from 1984. During eleven years, just the 136th Fighter Bomber Air Regiment performed 17 500 missions in Afghanistan! The Air Army's work horse was the Su-17 Fitter fighter-bomber type. During the war 16 of the Soviet front air force's 31 lost Su-17's was lost by the Soviet Turkestan Military District's Air Force. 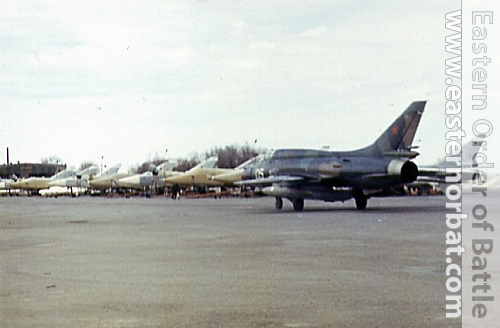 The 136th Fighter Bomber Air Regiment's Su-17M3 Fitter-H bomber at Chirchik airport after the war. The 168th Fighter Bomber Air Guard Regiment's mark is displayed on the side of the bomber. 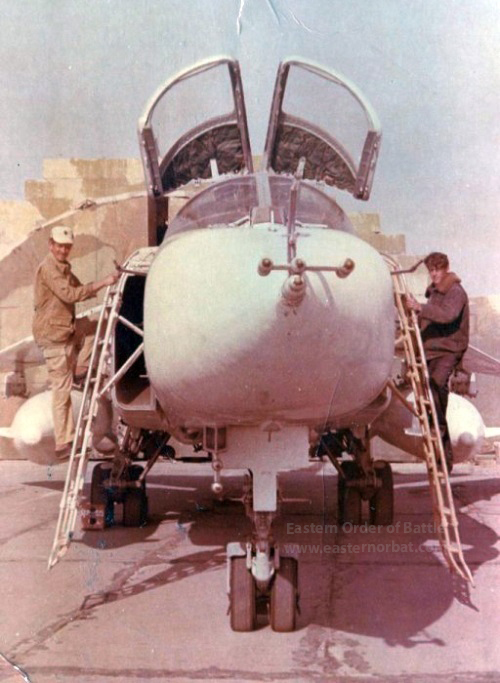 In the eighties the Soviet Turkestan Military District's Air Force types were modernized as well. Starting from 1984 they received three squadrons of used Su-24 Fencer-B front bombers, then between 1986 and 1988 one of the 87th Independent Reconnaissance Air Regiment's squadrons were retrained to Su-24MR Fencer-E reconnaissance aircraft. 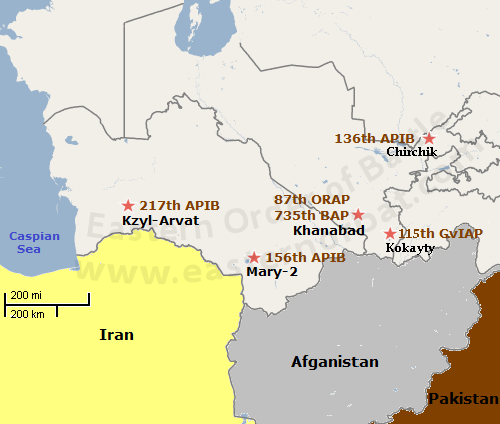 With the new high-performance Su-24's the farthest points of Afghanistan became accessible from the airports near the Soviet border. Left: Modern Soviet Su-24 Fencer-B long range tactical bomber of the 735th regiment at Khanabad airport. Since 1988, the Soviet Turkestan Military District Air Force became independent again as the 49th Tactical Air Army. 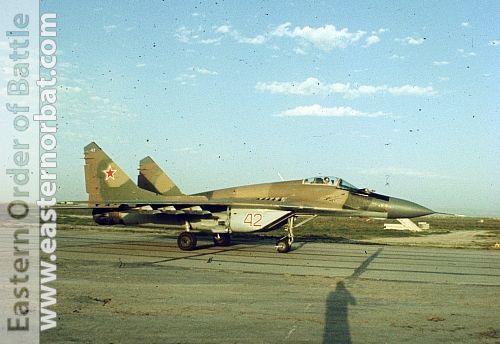 The 115th Guard Fighter Air Regiment's old MiG-21bis Fishbed-L type was also replaced in 1989 by the advanced MiG-29 9.13 Fulcrum-C type. Black and white photos of the 115th Guard Fighter Air Regiment’s MiG-29 Fulcrum. In 1988 the Soviet army withdrew from Afghanistan. Then in 1989, to reduce military expenses the Soviet Turkestan Military District and the Central Asian Military District has been merged. The 49th Tactical Air Army also merged into the 73rd Tactical Air Army. Until 1992 only one Military District remained again in Soviet Central Asia.